In a lesson for women entitled, “When My Love for Man Grows Weak,” I shared this verse and said, “Sincere love for one another is what keeps our relationships intact despite our shortcomings. But yesterday I heard a different application. Brett Petrillo, our youth minister, said that when we show love to a brother or sister, we are keeping them from going wayward. That really caught my attention! The point of his whole lesson was that when we all work together we can accomplish much. If one of us demonstrates love to a fellow Christian, that’s good. But if we ALL do our part to actively love that same Christian, he or she will be less likely to wander off into the world. Doesn’t that add an even greater motivation to love others? And it makes perfect sense. If we’re loving like we should, we will be patient and kind (1 Cor. 13:4). We will gently warn those who seem to be drifting and will help bear their burdens as they struggle (Gal. 6:1,2). We will be with them through their bad times (Prov. 17:17). We will give of ourselves (1 John 4:10,11). And from our text (1 Pet. 4:8), the next verses tell us how to show that love that covers a multitude of sins. “Be hospitable to one another” (v. 9). “Serve one another” (v. 10). What better way to grow closer to the Lord than to do our part to help others stay close to Him as well? There are members of your congregation who might be growing weary in their work, who feel lonely or left out, or who feel like the odd-man-out because they’re single or divorced. Choose one of those individuals or couples and have them into your home this week. Focus on them. Let them know you’re paying attention. Pray with them. Keep your eyes open when you meet with the saints. Seek out those you don’t get to speak to as often. Ask how they’re doing in a way that invites specific answers. Listen to them and hug them. Send a few “for no reason” cards to let brand new Christians, teens, or struggling members know you care. Who hasn’t been to worship in a while? Call them and let them know you miss them. It is this last point that I want to share with you. Brother Moore pointed out the different ways in which Paul prayed for God’s people. As Brother Moore said, “Satan doesn’t want Christians to see these things!” Imagine the impact we can have on strengthening the Lord’s church if we all began praying these same things. Oh how we need to unite and stand strong in our current culture! Pray these things for God’s people every day. Pray these things for your family every day. 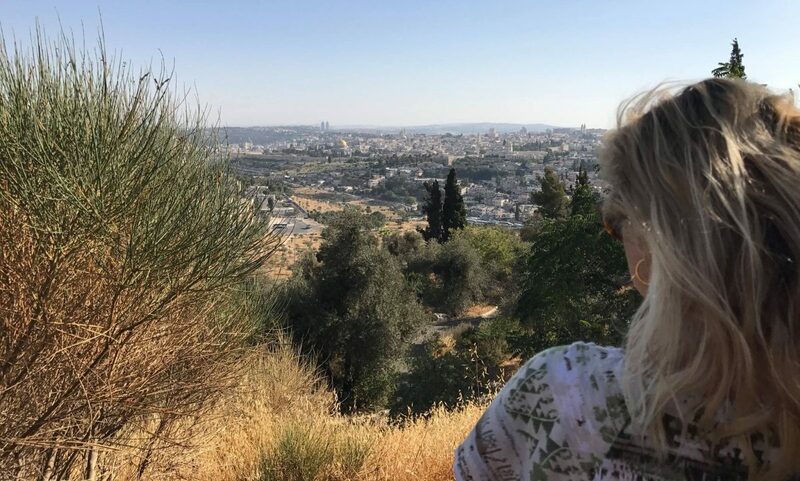 Look up the Scripture references and read Paul’s original prayers. In my personal life I’m in the midst of four major changes. Change is a natural part of life. I know this fact but I’m a chicken. I wrestle with fear, insecurity, and just saying goodbye to what used to be. While I may be the only chicken, I know I’m not the only one facing change. Our Nation Changes. From the leadership to the values it upholds, our nation is not the same as it used to be. I imagine we have more changes to come. Our Church Families Change. The kingdom will stand (Dan. 2:44) but the makeup of each body fluctuates. Neal and I were just discussing all the changes that have occurred in the ten years we’ve been here. Several members have gone on to their reward, various leaders have come and gone, and dear families have moved away. Our Homes Change. Children come into the home and then before you know it, children leave the home. Aging parents or others may need to live in your home. Even Our Bodies Change. Aging. Enough said. While the items I mentioned aren’t all negative, they are definitely changes. How can we face them gracefully? Remember the One who never changes. “For I am the Lord; I do not change” (Mal. 3:6). His promises stand regardless of shifting circumstances (2 Pet. 1:1-4). His love for us is constant (Rom. 8:37-39). Turn the changes into a challenge. Who doesn’t love a good challenge? It can be invigorating and life-giving. When fear threatens, remember that growth comes from being stretched. Facing challenges builds strength and confidence through Jesus Christ our Lord (Phil. 4:13). See the Blessings. Those who have experienced change will probably tell you that some good came about as a result (James 1:2-4). See the Opportunities. Times of change can be the perfect time to try new things, to test yourself, to walk through open doors that you’ve been hesitant to before. God has work for us always (Eph. 2:10). To prepare for changes in our nation, pray for courage. We all need to stand up for what’s right and shine for Christ regardless of threats, persecution, or personal cost. For changes in the church family, pay attention to who could use some love. New members? Recent widows? Help those who are most affected cope by being their source of encouragement. In your own family, thank God for any who might be in your care now. It is always a blessing. Open your heart to those who may need your care. Don’t be hesitant to let go and let God (*pointing to myself big time here). Concerning your body, keep up with time. Work to keep it in good condition so you can serve to the best of your ability. Exercise more, make better food choices, drink plenty of water, and don’t become crotchety. This year’s theme at Higher Ground was “A Dark World Needs Bright Lights,” but it’s easy to get discouraged when we think in terms of the whole world. It’s big, dark, and seemingly determined to reject God. There are some simple ways, though, that we can light up our world. We can make a difference in all the places we are this week…our homes and our communities. And imagine the difference it can make when we’re all lighting up our own little corners together! We can light up our world by smiling. Such a simple thing, really, but what an impact! I have to remind myself that my face doesn’t naturally fall into a joyful expression. Instead, it looks rather annoyed, or “long,” as someone recently pointed out. But I know many who are smiling every time I see them. It lifts me up, and makes me want to smile in return. I imagine all who come in contact with them are blessed, simply because the joy in their heart is reflected on their face (Phil. 4:4; Psa. 16:9; Prov. 10:28). I can smile more. Surely I can do that. We can light up our world by having a positive outlook. You probably know someone like this. Their life isn’t easy, but you wouldn’t know it from their words. They talk (and post) about the good in life, and the Source of their blessings. They keep looking up. Their trust in God permeates their attitude and demeanor. Because of their serenity, others are drawn to them, and want to know the secret to their peaceful confidence. How are they living brightly? Their lack of pessimism and complaint stands out, and points the way to Christ (Phil. 2:14; 4:11). If being optimistic helps others see Jesus, what does my grumbling do? I need to remember that. We can light up our world by encouraging others to see the Word. I’m thankful for the people in my life who do this. Their posts contain Scripture. They turn their life experiences into teaching opportunities. They remind us why we’re here, what the Bible has to say, and how we can make it real. With all of the worldly messages swirling around us, I am especially grateful for those who combat it with glimpses into the eternal, hope-giving Word. We can never get enough of that. They shine by turning simple, daily rituals into opportunities to plant the Seed (Mark 16:15; Psa. 96:3; Rom. 1:16). What if each day I look for at least one way to share the Word. Will it make a difference? Oh yes. God’s Word is living and powerful (Heb. 4:12). All I have to do is remember to help others see it. None of the three ways I’ve mentioned involve money or a great deal of time. There’s no fear of embarrassment or persecution, usually. It’s just letting God’s love shine through the darkness in simple ways. Smile. Smile at your spouse and your children. Smile in the checkout lines. Smile in traffic. Smile instead of scowl. No complaining, grumbling, mumbling, or sharing aggravations in the office, at the ball field, or on social media. Just don’t do it, at least for this week. Remember, your goal is to light up your world not sound like your world. Share, post, or tweet each day something about God’s Word. Become a name-dropper. God’s name, that is. In your casual conversations, look for ways to insert ways that God blesses, protects, and strengthens. About 6 weeks ago, I bought a little bracelet and I’ve been wearing it nearly every day since. Just yesterday morning in Bible class, I discovered that it has something written on the underside. 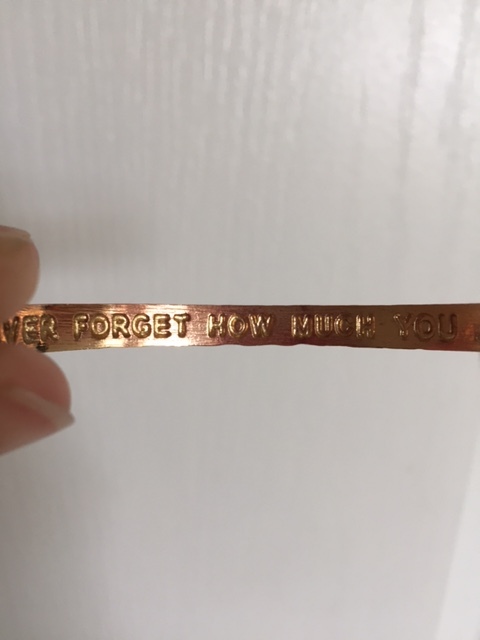 It says, “Never forget how much you are loved.” I was so surprised and couldn’t believe I never saw it before then. All this time that bracelet has been right there on my wrist yet I had no idea that sweet message was waiting for me. Now I like the bracelet even more! I wonder how many other things I’ve missed out on because I wasn’t paying attention? Bible study. I always have a Bible nearby. I try to read it daily. But am I paying attention? Am I examining it closely and focusing on the details? Am I seeing God’s message? Relationships. I have family and friends all around me. But am I paying attention to them? Do I see their cues, hear their hints? Have I been so distracted by my own schedule or constantly checking messages that I’ve been missing the needs of those most dear to me? Have I missed out on some friendships because I’ve been blind to efforts to reach out to me? Blessings. They’re everywhere, everyday. But have I taken them for granted? Have I even seen the blessings, big and small, that God sends me so that I will get His message, “Never forget how much you are loved”? “Oh taste and se that the Lord is good” (Psa. 34:8). Study the Bible intentionally. Look closely. Examine each word. See how sweet and dear God’s message is for you! Notice every thoughtful gesture by the people around you. Acknowledge them. Recognize it as yet another proof of God’s love and care for you. See the blessings, physical and spiritual. Help others see them. Ask God to help you keep your eyes open to them. Put your phone, laptop, iPad, whatever away. Instead of looking down at your device, look around and SEE people. Smile, connect, and see their messages.